OWC 'Data Doubler' SSD/2.5" Hard Drive installation Kit for Mac mini 2011, 2012 & Later Models with Upper Drive Bay populated. Running out of storage space in your Mac mini or looking to improve performance with an OWC SSD? Now you can add a second 9.5mm or smaller 2.5" SATA Hard Drive or Solid State Drive (sold separately) to your 2011, 2012 or Later Mac mini. A small number of 2012 units were shipped with the drive mounted in the upper drive bay rather than the more typical lower bay shown in this video. If you have a 2012 or later model, you will want to determine the configuration of your Mac mini's drives prior to ordering. To do this, open Applications/Utilities/Disk Utility.app and click on the grey drive icon at the left-edge of the window. If you see "Lower" after the "Connection ID" at the bottom-left corner of the window, you need only the standard OWC 'Data Doubler' SSD/2.5" Hard Drive Installation Kit. If you see "Upper" then you have a special configuration which will need these additional components, and you will need to also refer to the Addendum video. 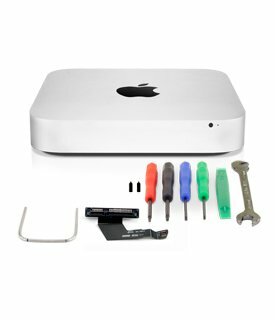 Includes: OWC 5-Piece Mini Toolkit, Logic Board Removal Tool, 5mm Wrench, 2 Set Screws, Mac Mini flex cable, EFI Shielding material for 2012 Mac mini, Data Doubler for Mac mini (2011-2012) Installation Guide (Download Only), Supplemental Install Guide. Compatible with: Mac mini (Late 2012)Model ID: Macmini6,1 & Macmini6,2 (2.3GHz, 2.5GHz, 2.6GHz). Mac mini (Mid 2011) Model ID: Macmini5,1 & Macmini5,2 (2.3GHz, 2.5GHz, 2.7GHz). For Mac mini 2011, 2012 & Later Models with Upper Drive Bay populated: Open Applications/Utilities/Disk Utility.app and click on the grey drive icon at the left edge of the window. Next click the "Info" button on the toolbar. A window will open. Scroll to the "Location" item. Choose the kit that matches your "Location" item. This unit is for Connection ID Upper".